It was hard to believe that the most recent chef demo we attended was the last of the Golden Chef series for the Golden Foodie Awards 2013. There had been three before it featuring Golden Foodie Award winners and nominees. 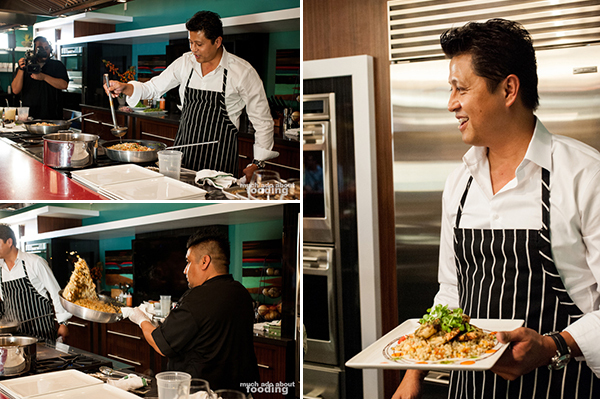 This event time, we were graced by the presence and expertise of Chef Louie Jocson from Red Table in Huntington Beach who prepared "Shrimp & Pearls" for the audience. Chef Charlie Plummer, Sommelier with the Jackson Family Estate Wines, was once again the lively, crowd-pumping host, and the venue for this demo was again the Sub-Zero and Wolf Show Room in Costa Mesa. 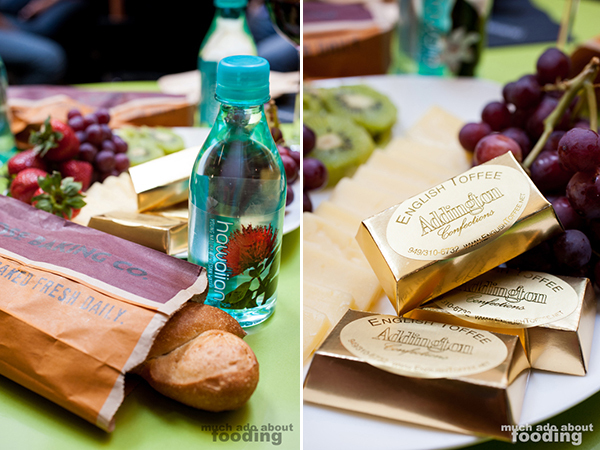 As always at these events, we had plates of fresh fruit by Melissa's Produce, artisan bread by Sadie Rose, toffee by Addington Toffee, and wine by La Crema out for nibbling on while the demonstration went on. 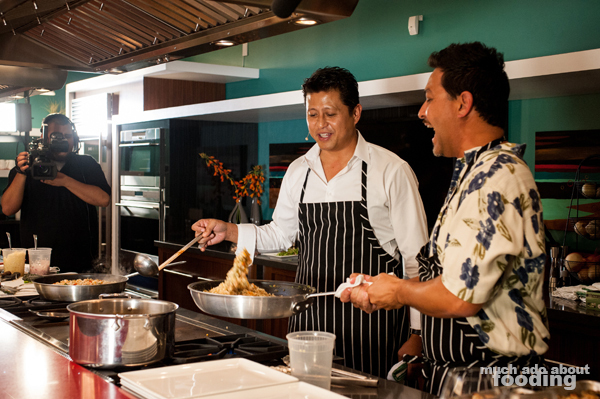 Charlie began with introductions of Chef Louie Jocson, sous chef Gonzalo (aka Pumba! ), and helper Christina from the Arts Institute. Chef Louie is the creator and executive chef of Red Table in Huntington Harbor who created it with memories of good times with friends in mind; they would gather together to do the core things to de-stress in life - Relax, Eat, and Drink around the table. It became obvious to the chef that his place would have to be called RED Table then. 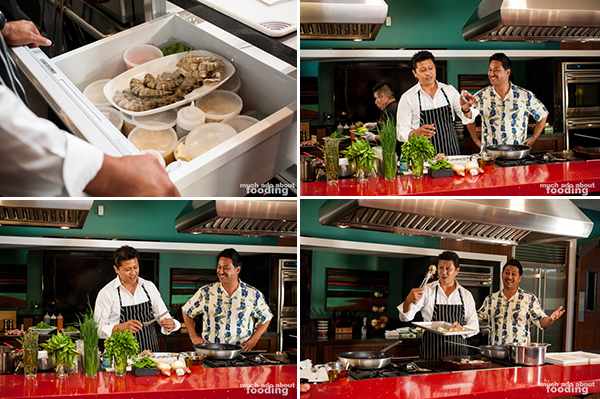 Filipino with a Hawaiian background, Chef Louie has been in the kitchen since he was young. In a household with four other brothers and nary a sister in sight, the culinary chores of the household fell upon each of the siblings; though they hated it then, it became obvious that this exposure blossomed into his passion. 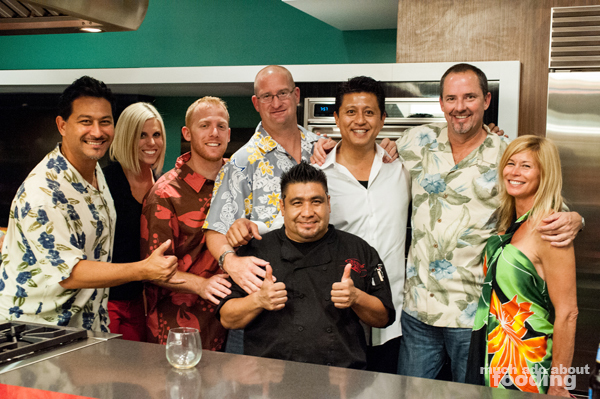 Red Table recently celebrated its second anniversary on July 25th but prior to that, Chef Louie had been involved with start ups to full blown restaurants. Trained at the Culinary Institute of America in San Francisco, he finally put together his home-style restaurant which is designed to be just like coming to a person's house for dinner - no hostess in the front, sitting wherever wanted, and no signage all over the walls. It is formed to be welcoming and reminiscent of a familiar environment filled with plenty of great food. 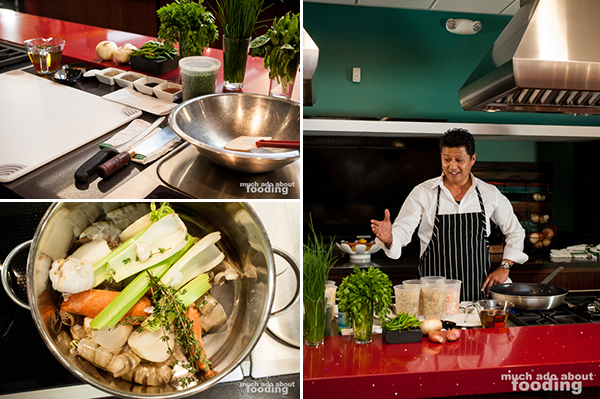 We took a look at his work station which focused on fresh herbs in water glasses and stock made from fresh produce for the mirepoix & shrimp shells for the base. Fantastic. 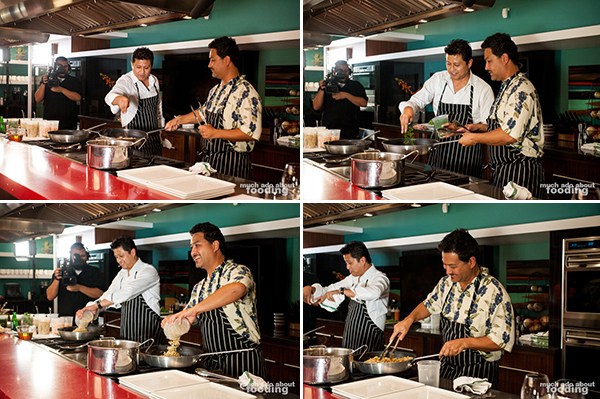 To give us all a special treat and prevent our grumbling stomachs from drowning out the sounds of his voice during the demo, Chef Louie specially prepared his poke dish for the audience to share. It was chopped to perfection and contained a stunning (but brief) kick of spice. 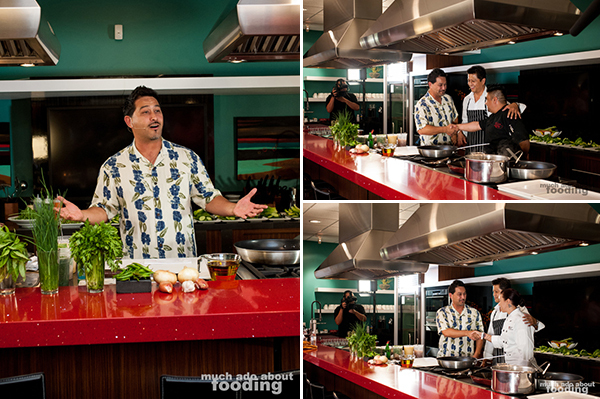 As we ate that bit of seafood, we learned how he picks his seafood of choice for the dish: Black Tiger Shrimp. By the way, that is my favorite shrimp, and I was glad to see that we would all be partaking in its succulence. These ones from Thailand were U8-10 (meaning 8-10 units per pound which he explained to the audience). He showed guests how exactly to pick out the freshest and best shrimp (crimson legs, dark black stripes, shell-on, and clean smell), how to save their thick shells to make stock, and how to clean them out before cooking. These were grilled after being marinated (garlic, shallot, salt, pepper, dried oregano, Italian parsley, chili flakes, and olive oil) to partial doneness (if no grill is available, he recommends a grilled pan) and finished off in the convection oven similar to how a steak would be done. 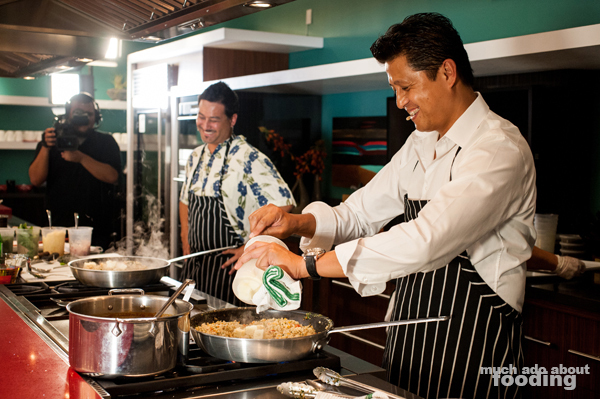 For once, we got to see host Charlie in action as Chef Louie invited him to assist in the cooking. During this interaction, we learned that the simplest meals will make chef happy, especially ones that his wife prepares. A rotisserie chicken is no match for him ("I will eat the whole chicken.") but don't give him peanut butter - that's the only dislike so far! After they brought the oil to its smoke point, diced tomatoes were added to slow heat and provide moisture before basil, chives, parsley, and parcooked chopped shrimp were added in. Chef's main tip for the night was to layer flavors and seasonings during cooking so that you are seasoning at the beginning, middle, and end. 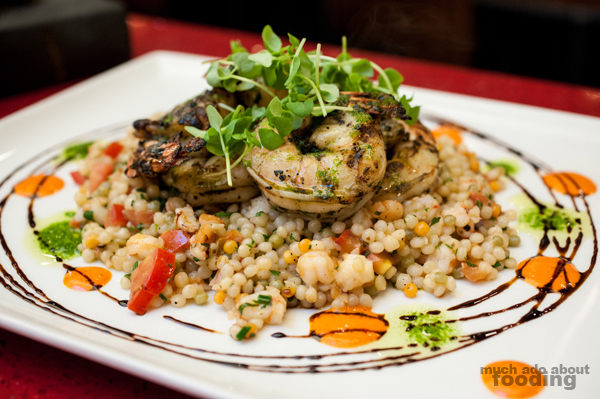 The "pearls" for this dish were Israeli couscous, and the style was risotto-like. 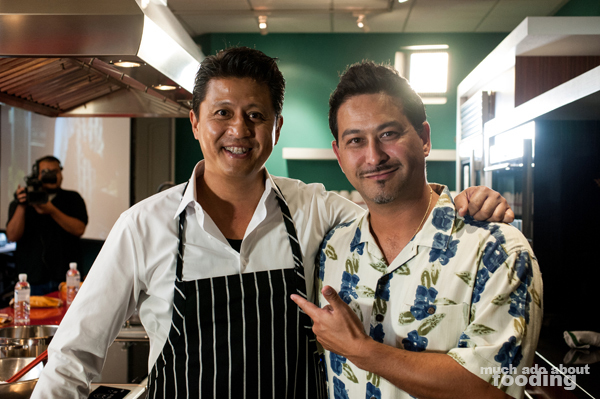 As we got closer to the finish, Charlie asked a bit about Chef Louie's stance on the "unhealthy" foods in cooking, particularly MSG which is still prevalent in Asian restaurants. His response to that specific additive? "I grew up on MSG. That's how I'm so well-preserved!" Then he, of course, proceeded to finish off the risotto with his cooking companion - "This is about taste, and butter is my friend." We sure got to taste what that addition was like, and there were no complaints anywhere! To beautifully plate his dish, Chef Louie added colorful droplets of herb oil and roasted red pepper oil before graceful lines of balsamic reduction were laid around the pearls. Basil microgreens topped the beautifully slightly-charred shrimp, and everything was finished with an homage to his Hawaiian side: Kauai red clay sea salt and black lava sea salt. Charlie was on hand to guide guests into pairing this dish at home if they so desired to try making it. For its light body and mouthwatering traits, a Pinot Gris was selected. 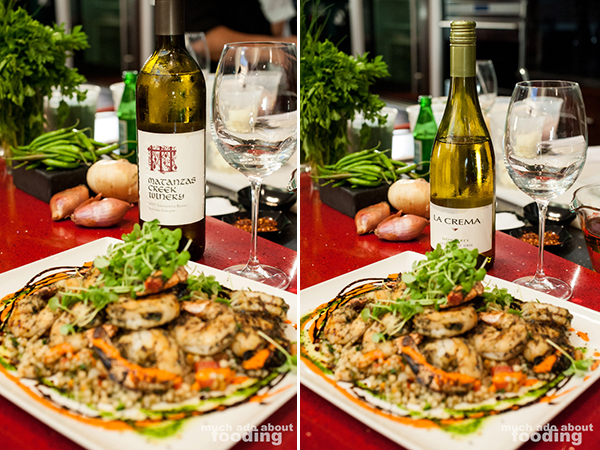 For the citrus notes best complementing seafood, a Sauvignon Blanc was picked. 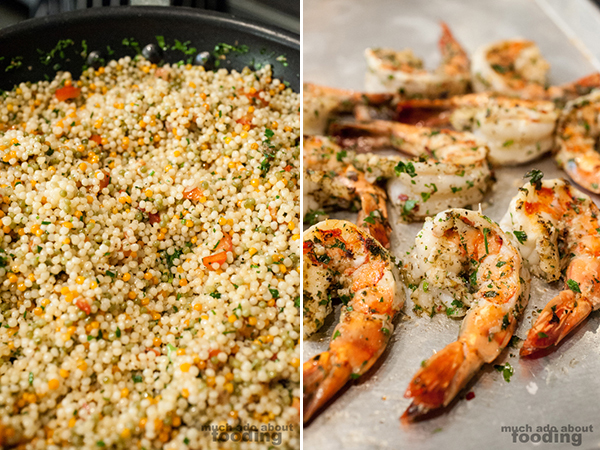 Both were chosen for their compatibility with the whole dish based on weight, acid, salt, and intensity. It was an informative, brief tutorial into the world of wine-pairing, and I'm sure the guests appreciated the tips! We found the dish to be not just gorgeous to look at but to taste as well. The shrimp had been cooked to the perfect texture, and the seasoned pearls lent a fine, fresh finish to the meal. 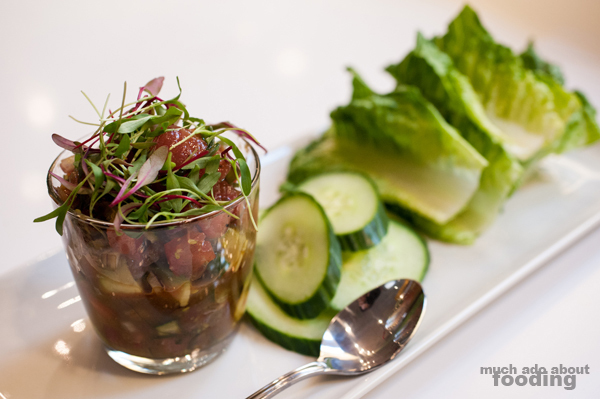 More reason, aside from the Chef's amicable nature itself, to visit Red Table in Huntington Harbor! Our thanks to the crew for having us and for putting on a great show. Photography by Duc Duong. More pictures available on Facebook here.